Crude oil prices started the week on a neutral note just hovering below the $69.5 resistance level. However, according to Russian news agency TASS, Saudi Minister of Energy and ARAMCO chairman Khalid A. Al-Falih said on Monday that “Saudi oil production is likely to rise in the near future to 11 million barrels per day on a steady basis, but the Kingdom cannot guarantee that prices won't rise above $100”. He also pointed out that Saudi Arabia used oil policy as a responsible economic tool and isolated it from politics and that OPEC wants to sign an open ended agreement with non-OPEC. On the other hand, tensions between the US and Saudi Arabia are on the rise and that could reflect in a positive way for Crude oil prices. Oil prices broke below the $70 level after breaking the long term purple trend line to downside and settled just above the $69.5 level. 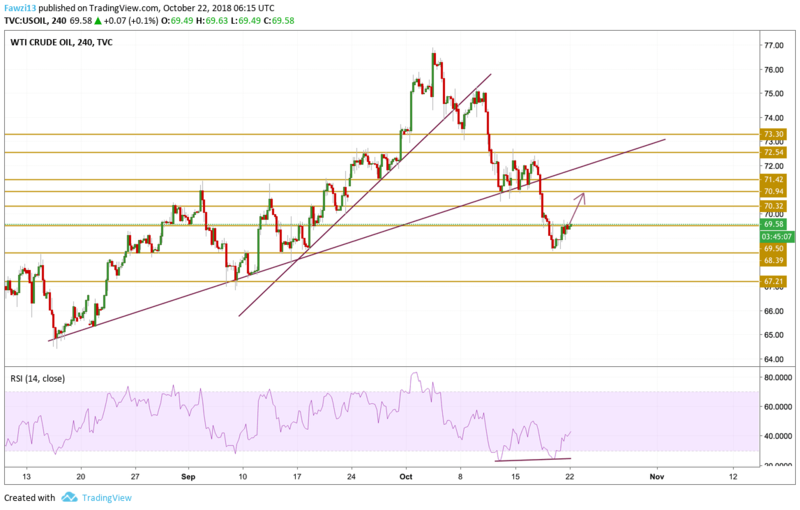 The RSI is pointing towards a huge divergence of the momentum with the price so a little pullback or a retest of the recently penetrated $70.9 level is expected to occur.